Walt Disney himself likely found inspiration for Dumbo in the “half-pint’ sized Pygmy Elephants of Borneo. Baby-faced with oversized ears, plump bellies and tails so long they can drag on the ground, the Pygmies are also more gentle-natured than their big cousins, the Asian elephant. Researchers believe that the elephants were descendents of an elephant population that initially lived in Java (an island in Indonesia). The sultan of Java was believed to have given the baby-faced elephants to the sultan of Sulu as a gift. For undetermined reasons, descendants of those elephants were later shipped to and abandoned on Borneo. Meanwhile, back on Java the elephants’ population dwindled. By the end of the 1700s, the pygmy- elephant was believed to be extinct. 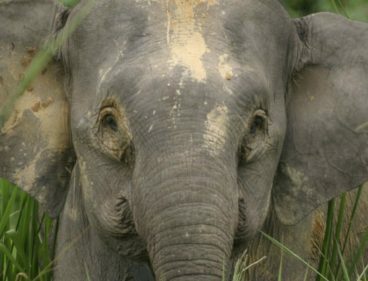 According to Michael Stuewe, an elephant biologist of the World Wildlife Foundation, the pygmy elephants on Borneo might be the oldest example of a wild mammal population that was inadvertently saved by royalty. Today, another member of a royal family is trying to save elephants from extinction – Prince Harry of Britain. In this case, Prince Harry is doing it ON PURPOSE. He has dedicated his life to ending the ivory trade, and poaching, and saving the highly intelligent Elephant as well as Rhinos from extinction. What a hero!